I don't know much either except that the seeds and saplings are well traded in Thailand, possibly different species, definitely different colors. I read chilling the seeds in the fridge first aids germination, lots of reading available... don't have the time. Always figured it was a novelty, If it really tastes good, and is native to Thailand in the north, why hasn't it been propagated heavily. It's rarity is likely due to a lack of taste or something else negative. Jared the Weirdfruitexplorer did a review on one of these a while ago:https://www.youtube.com/watch?v=0Jb2RvX3vVs. He says it is tasty. Doesn't look like there is much flesh to each segment, but it's a fairly large fruit overall. Probably a bit of effort to eat. I got seeds of a "Kadsura sp" from Thailand. I was a little apprehensive since the seeds were in pretty foil packs with pictures on them, like they were being sold in stores. I soaked the kadsuras in water until they sank (don't recall how long that took) and put them in a baggy with damp sphagnum. The first of the seeds starting germinating within a couple of weeks. They have been sporadically sprouting now for about 2 months, with almost all germinated now. So, unless it is a temperate species in question, I don't think a chill is required. It is interesting to note that I have not seen any above ground growth of those seeds I have planted. Hopefully, they are growing roots first & have not just decided to die once they were put in soil. By the way, I got zero germination (seeds rotting) on the other, recalcitrant seeds I got from this guy. Did you get from the Kadsura 'research' group, collection group? They advertise quite a bit on the Thai fb groups. The author said they soaked in water, then planted in plastic cups watering continually for 2-3 months, and many rotted out. After that he put in the fridge one night, then had better luck. I could not discern how this was better outside of his opinion, he didn't mention how fast the germination was after trying the fridge trick, or if he also soaked in water this time, then chilled, or exactly how it worked. Which guy sold you bad seeds? 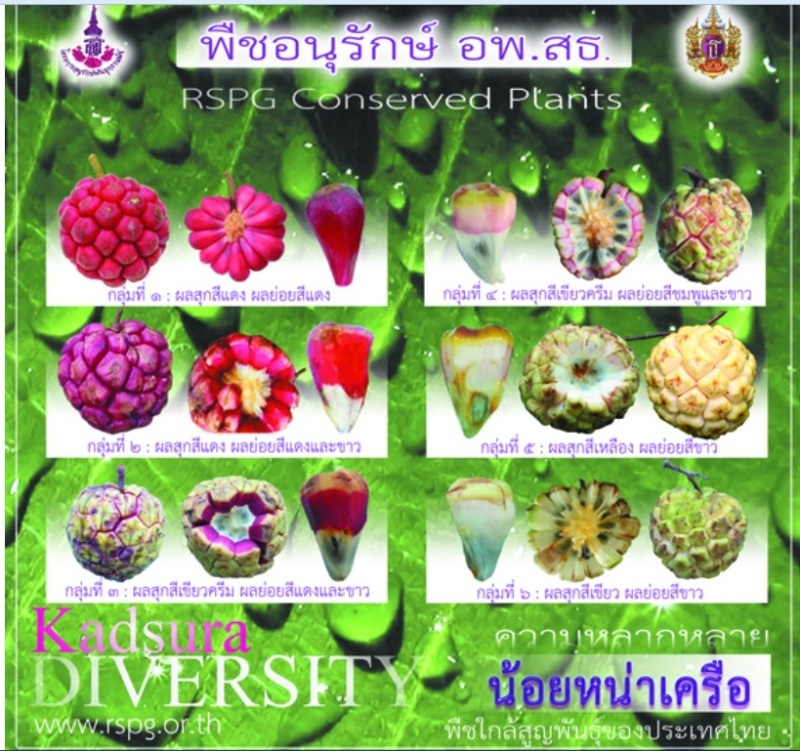 this is a picture from the research group, which says they are part of a foundation sponsored by Princess Maha Chakri Sirindhorn for the conservation of seeds and plants. I believe she also founded a large park in the mountains in Chiang Mai I visited before, which is quite amazing, about 20 very large greenhouses each with different ecosystems and themes, very well labeled. The seeds I had trouble with were Baccaurea and Melodorum seeds but the Kadsura seeds seem fine. I bought them on ebay (I know that is asking for trouble but they were cheap & looked like what they claimed to be -- I don't mind as much getting bad seeds if they are cheap, I have spent a lot on seeds from some vendors on this group that were also junk). The vendor was "beautyladyinfo". I looked at the seeds again today. I misspoke, 2/3 of them have now germinated & were planted in pots. I noticed the first sprout coming above ground today so it evidently takes about 1 1/2 months after germination for the sprout to appear above ground. I don't recall how long I soaked the seeds initially but it was longer than the overnight soaks I often do. It may have been 2-3 days. They then went into damp (not wet) sphagnum in a warm area. So, does this research group sell seeds? I may have to check them out. The poster looks interesting. Any chance you could translate the captions for us? as in the first photo they have unique way of describe fruit but my translation will be creative as well. I have seen many people call this fruit 'noy na pa' or Jungle Sugar Apple. I had some interest before in planting maybe next year the ag fairs will have saplings for sale. I think the organization is likely not actively selling but sharecropping on royal lands. With seeds on the market collected by the farmers for side income.